Professional Series BioWoman for colored hair to fix the color, care, nutrition and protection. 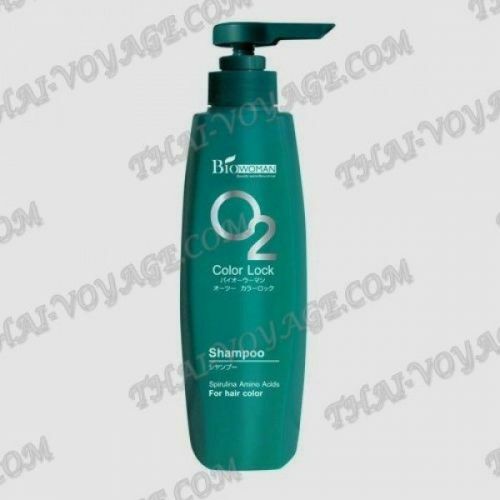 O2 - with the effect of a series of color block, this shampoo is specially designed for colored hair. This latest cutting-edge innovation - special formula contains oxygen, which is extracted from spirulina algae chlorophyll and has a high permeability. Shampoo not only cleans the hair, but, and nourishes, strengthens and activates hair growth, improves scalp circulation by increasing oxygen consumption, as well as by purification from residual chemicals from the hair and scalp, thus preventing hair loss and normalizing work sebaceous glands. This unusual formula is very effective to care for colored hair, returning it smooth and radiant shine. Colour Lock Technology (Color on the lock) helps maintain a long bright color dyed hair and deeply moisturizes the scalp, makes colored hair silky and shiny, even with frequent washing of hair. The result - healthy, shiny, silky and obedient hair that is easy to comb and do not go awry. For best results we recommend to use together with looking after the mask and serum vitamin O2 Colour Lock BioWoman.